Groundwater Monitoring & Borehole Flow Monitoring with Distributed Sensing Technology | Silixa Ltd.
Subsurface environments are critical not only as water resources but also for energy use including geothermal, CO2 sequestration and oil & gas operations. These sensitive environments are directly affected by anthropogenic activities; hence monitoring is essential. Temperature offers insight into a variety of physical properties and can be used for flow monitoring and flux quantification in the subsurface and to obtain a detailed understanding of how groundwater and surface water systems interact. The resolution capabilities and durability of Silixa’s DTS instruments as well as optimized cable designs to enable rapid and reliable deployments have made the ULTIMA™ DTS and XT-DTS™ families of instruments to become the industry standard for groundwater applications. iDAS™ has enabled seismic characterization in aquifers and hydromechanical monitoring of fractures. Fibre optic distributed temperature sensing (DTS) bridges the gap between aerial infrared techniques that measure only the temperature of the surface or a water body and point sensors that can be installed at depth but have limited spatial coverage. The spatial coverage and ability to install fiber optic cable directly at the surface water – groundwater boundary has enabled DTS to become widely adopted. DTS has been applied to numerous studies around the globe to locate groundwater discharge into surface water bodies, to quantify groundwater discharge flux, and even to predict the impacts of vegetation on stream temperature to monitor and improve ecosystem health. Distributed sensing enables measurements at all depths in a wellbore simultaneously, without disturbing the water column through trolling methods using wireline probes. Installations can be made for boreholes ranging from tens to hundreds of meters in length. Methods have been developed for monitoring flow in the formation in either natural gradient or pumped conditions, or for identifying inflows or outflows during pumping or injection. Wellbore inflows and outflows can be monitored and optimized in a depth-discrete manner. DTS can provide data for models for 3D imaging of temperature changes at the aquifer scale. Active (heated) DTS measurements enable characterision of the apparent thermal properties at every depth. Active-DTS data can be used to measure lithologic changes as well as relative flow. Through long-term monitoring, visualization of dynamic processes can be realised. Distributed acoustic sensing using iDAS has been applied to quantify the hydromechanical response of individual fractures due to hydraulic stresses. Detection of nanometer scale processes at all locations in a borehole is a transformative capability for in-situ borehole measurements. By applying at the aquifer scale, iDAS data enables monitoring aquifer heterogeneity and the interconnectivity between wells. 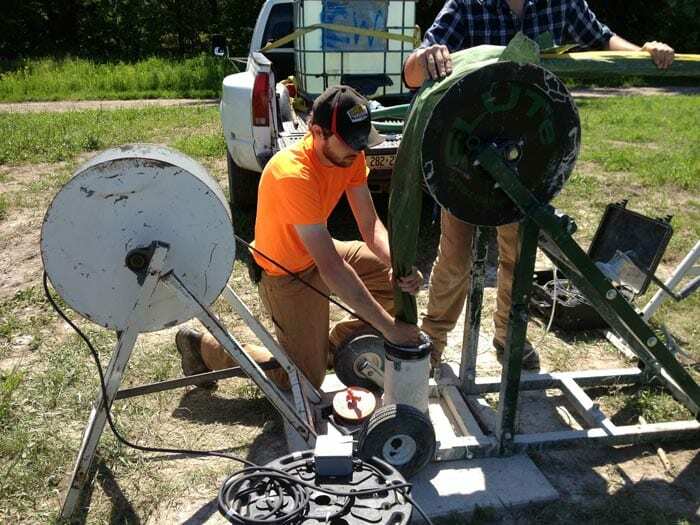 Active DTS methods can be used to measure groundwater flux distributions in fractured rock aquifers by utilizing boreholes sealed with flexible liners. The installation of fibre optic cable enables the ability to collect distributed data in both surface water bodies and wellbores. Whether for a current application or to enable future measurement possibilities, the addition of optical fibre transforms an installation into an array of virtual groundwater sensors. Silixa’s customised cable solutions can be installed temporarily in open boreholes, permanently into grouted and cemented wellbores, temporarily installed with flexible borehole liners, or integrated into multilevel systems (MLSs) to provide a robust platform for groundwater monitoring.